Situated in Havre, this hotel is 2 mi (3.2 km) from Beaver Creek Golf Course and 3.3 mi (5.3 km) from Patterson Park. Clean, comfy beds, friendly staff, easy access off of highway. Upon check in we were placed in a room on the back side of the building. Within a few minutes the train went by and it became evident why each room has complimentary ear plugs. We called the front desk and were immediately placed in a front room. Staff were quickly and happily ready to satisfy our request. The pool area shares clear glass with the Casino/Bar many families opted out of the experience. Where to find Havre hotels near an airport? Where can I find hotels in Havre that are near tourist attractions? Expedia's up-to-date accommodation booking platform features 4 hotels within a 0.1-kilometre (0.06-mile) radius of Havre. 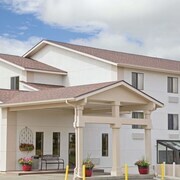 The AmericInn Havre, Montana, which is the nearest accommodation, is 20 kilometres (13 miles) from downtown Havre. Another convenient option is the Best Western Plus Great Northern Inn, in Montana, which is 19 kilometres (12 miles) from the heart of Havre. The Townhouse Inns Of Havre is 20 kilometres (12 miles) away from the middle of Havre. 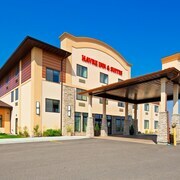 20 kilometres (13 miles) away is the Best Western Plus Havre Inn & Suites which is an alternative. Now that you have checked out what hotel options are available in Havre, take the time to visit our Havre travel guide for the inside scoop on things to see and do in this part of the world. Are there hotels in other cities near Havre? Explore Havre with Expedia.ca’s Travel Guides to find the best flights, cars, holiday packages and more!